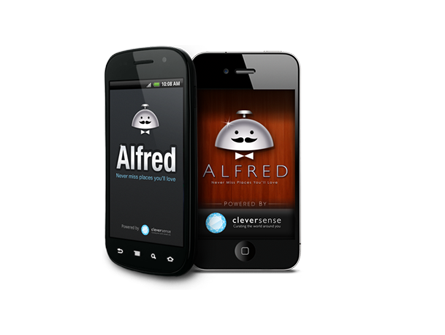 Google (s goog) announced it has bought Clever Sense, maker of the smart local recommendations app Alfred, giving it some extra Siri-like intelligence. The deal, which comes on the heels of rumors that Groupon (s grpn) was interested in Clever Sense, arms Google with yet another tool to attack the local market, as it seeks to scoop up more ad dollars and be the go-to resource for all things local. Clever Sense uses a combination of machine learning and artificial intelligence to help best predict which restaurants, bars and clubs you’d like to go to. I’ve used it on the iPhoe (s aapl,) and it’s a pretty smart tool, that takes input from a user and turns it into better and better results. Clever Sense will join Google local team and will help improve Google’s ability to suggest places for people to discover. Babak Pahlavan, co-founder and CEO of Clever Sense, said combining with Google will help accelerate the start-up’s plans to curate the world and brings its discovery service to many more people. It sounds like Google will continue to let Alfred live on, but it’s also possible we could see it shuttered at some point with its features subsumed into Google properties. This continues a buying spree for Google, which bought local reviews service Zagat in September and local deals aggregator The DealMap in August. Google also recently launched Google Schemer, a recommendation engine for activities, and it’s moving forward with its Google Wallet and Google Offers products, which tie payments and deals together. Stepping back, it’s clear Google wants to be the lens through which people see the local world around them and the layer between consumers and local merchants. By putting together reviews, content, recommendations and deals, it can draw in consumers who are increasingly using mobile devices to search for local results and explore the world around them, and it can pitch itself as an advertising channel and customer acquisition tool for merchants, which are moving away from old paper coupons and print ads. Clever Sense also gives Google more artificial intelligence as it competes with Apple (s aapl) and its new voice assistant Siri. While Siri is still off to an uneven start, it shows a lot of promise in understanding consumer intent and eliminating barriers that keep people from information. Google itself is trying to become one big artificial intelligence product but it can still use help in becoming more aware of people’s interests and intent. EBay (s ebay) just bought Hunch, another recommendation engine, following up on an earlier acquisition of WHERE. Not every recommendation is going to succeed or get bought up, (see Bizzy) but there’s clearly an interest by some big companies to get smarter and provide very intelligent assistants and robots that understand what people want. Marissa Mayer, Google’s head of mobile and geolocation, talked at South by Southwest about using mobile phones to help bridge the physical and digital worlds and help bring the “power of here” to reality. 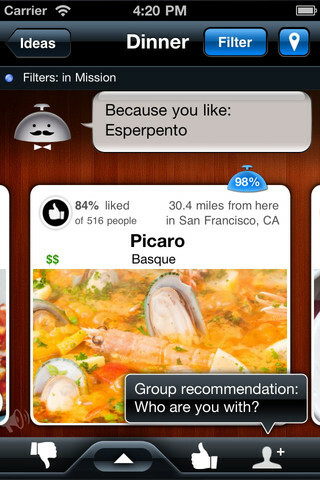 And more recently, she talked about providing more serendipitous suggestions to users. More and more, we’re seeing that local vision take shape as Google buys up the pieces to bring it all to life.